This mod may not be reused in part or whole for any purpose other than its original intent. It may not be uploaded to any other web site. Get in touch with me if you wish to discuss things; for example, translation into a non-English language. Mr Law robot which provides law enforcement services for a settlement. 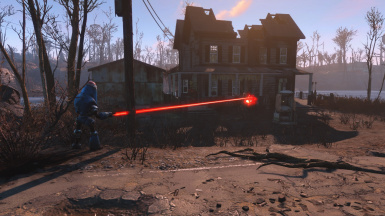 This mod provides a "lore friendly" approach for automatically providing law enforcement services within a Settlement by enabling you to assign that task to a RobCo Mister Law Protectron robot. Simply position the Protectron Police Pods on the ground in areas where there is the highest risk of encroachment by outlaws and dangerous wildlife. The robots will perform a sensor scan periodically to find potential threats in the surrounding area, and return to their pods whenever peace and quiet is re-established once more. Activate a pod to modify default settings. See the included HoloTape (Mr Law's User Guide) for details. There is a brief initial mission / quest. It normally begins after escaping from Vault 111. For those using an "alternate start" mod, it begins while outdoors in the Commonwealth (the main game area) -- or try visiting Sanctuary Hills and stand near the Workshop for a few minutes. WARNING: Not compatible with "bad guy" Player Characters; e.g. when allied with Nuka-World Raiders. There are five (5) model variations of the Mr Law protectron police robot. They are constructed using a Workshop and require successive increases in Player Character level and Science skill. Each "Mark" unit is more powerful than the preceding units, and provides an improved "Defense" rating for settlements. It is usually best to place pods on the ground, and in areas where there is the highest risk of harassment by potential enemies. If positioned above ground, be sure to build appropriate ramps and stairways that can be easily used by Mr Law when leaving and returning to the pod. For enclosed settlements with walls and barricades, be sure to have a sufficiently accessible entry / exit portal that enables Mr Law to get beyond the settlement's defenses in order to fight distant enemies. Note that there is a slight delay after positioning a Pod before it can be interacted with to adjust settings. Mr Law's protectron police pod will have a Blue light when Mr Law is functioning normally. The light is Yellow when Mr Law has been damaged and needs to be repaired. The light is Red when Mr Law has been destroyed. Mr Law can be repaired when damaged (Yellow indicator on the Pod) by interacting with its Protectron Police Pod. There is no resource cost for repairs. If Mr Law is destroyed (Red indicator on the Pod), a new Mr Law must be created by using the Workshop to reset ("repair") its Pod; i.e. the bot is not restored by interacting with the Pod, since the Pod becomes non-functional until reset. There is a resource cost, but that cost is less than scrapping and reconstruction. 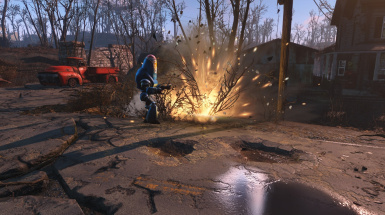 NOTE: Use the Workshop to repair the Protectron Police Pod if Mr Law has been destroyed. The following settings can be adjusted by interacting with a Pod. They are disabled by default. Mister Law is placed in a settlement by using a WorkShop to build a Protectron Police Pod. The Pod can be found in the DEFENSE>TURRETS section of the WorkShop's building menu when an initial quest ("The Law Bringer") is completed. 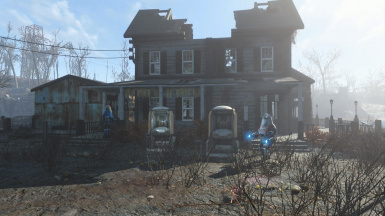 The quest appears shortly after leaving Vault 111 for normal play, or when outdoors in the Commonwealth when using an "alternate start" mod. If the quest does not appear when expected, then double-check to confirm that this mod has been enabled. Note that there is a slight delay after building a Pod before it can be interacted with to adjust settings. A functonal Protectron Pod (for use by other protectrons) can be crafted using a WorkShop within DECORATIONS>MISCELLANEOUS. When Mr Law is damaged (injured), the indicator light on the Pod will be Yellow instead of Blue. Interact with the Pod and select the Repair option to restore Mr Law to normal operation. There is no resource cost for performing repairs. When Mr Law is destroyed (killed), the indicator light on the Pod will be Red. When this occurs the Pod will be disabled and no longer functional. 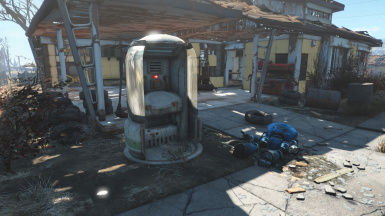 To restore Mr Law and the Pod to normal operation, use the Workshop to "repair" the Pod. There is a resource cost for doing this reconstruction, but the cost is less than scrapping and rebuilding them. Install using a mod manager, or unpack the mod and copy the .ESP/.ESL and .BA2 files into the game's \DATA folder, then enable the mod. Position this mod's .ESP/.ESL file to be as low as it will go in your "Load Order" sequence. Saved games that currently use an .ESP mod are not compatible with an .ESL of that same mod. Similarly, saved games that are currently using the .ESL for a mod are not compatible with an .ESP of that same mod. That is a basic game restriction in terms of switching between .ESP and .ESL versions of a mod. There is no "fix" or workaround -- it is inherent in the game's design. Objects and NPCs provided by the mod will not be there now and must be created once more. Similarly, quests will need to be done again. No special requirements. DLCs are not needed. 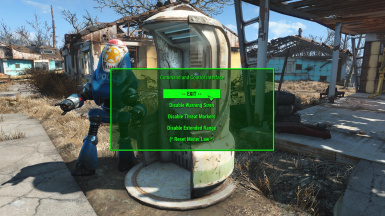 If you experience crashes while traveling during the initial quest, or are unable to complete that quest, it is then highly likely some other mod has been installed that "breaks" the Vault 111 area (or possibly the Sanctuary settlement) thereby preventing this mod from working correctly. If you are not able to find the DEFENSE>TURRETS subcategory, then you installed a mod that alters the basic construction categories of the game. In which case you may not be able to build the Pod, and hence will not be able to use this mod -- if you are lucky, the conflicting mod may have simply rearranged items, with the Pod now residing elsewhere in some other category or subcategory instead of where it was intended to be. For example: "Homemaker - Expanded Settlements" changes the game's workshop menus, but keeps the original menu entries in a different location within the menu hierarchy. Uninstall with the mod manager that was used for the original install, or delete SettlementCopBot files. This mod may not be reused in part or whole for any purpose other than its original intent. It may not be uploaded to any other web site. Get in touch with me if you wish to discuss translation into a non-English language; prior approval is mandatory. See the Change Log to review what is included in each update. Shield Bubble can be found Here. Qwirky can be found Here. Sparky can be found Here. Silver Streak can be found Here. Silver Streak UFO can be found Here. Whirly can be found Here. Whirligig Sentry can be found Here. Settlement Radar Station & Drone Defenders can be found Here. 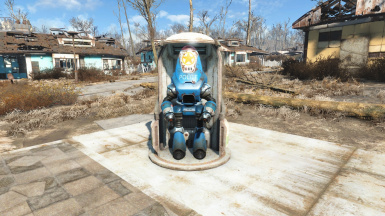 Settlement Medic Bot: "Mister Medic" can be found Here. 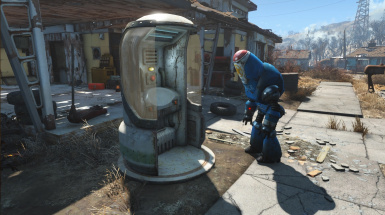 Settlement Repair Bot: "Mister Mechanic" can be found Here. Settlement Tidy Bot: "Mister Tidy" can be found Here. Settlement Salvage Bot: "Mister Salvage" can be found Here. Alien Disruptor can be found Here. In memory of my Father (may he Rest In Peace) who was a model airplane maker (gliders & gas powered) and an RC enthusiast.